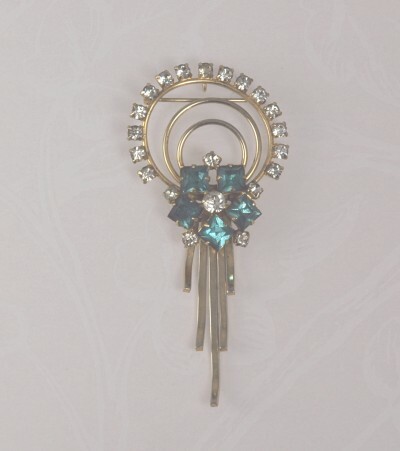 So stunning is this circa mid 40s fringed brooch that can also be worn as a pendant. It is well constructed and especially pleasing to the eye. Five aquamarine rhinestones and five clear chatons seem to catch the triple loop. The setting under the aquamarine stones is open in the back showing the foil. The outer loop is decorated with clear rhinestones. All stones are prong set. Condition: Excellent vintage. Minor wear to the metal as expected from age. Measurements: 3" long and 1 1/2" wide.